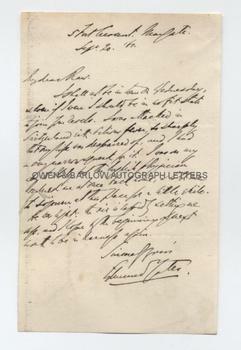 EDMUND YATES autograph letter Signed. British (English) novelist and dramatist. ALS. 1p. 5 Fort Crescent, Margate. September 20th 1861. To [D.R.] Raw. "I shall not be in Town on Wednesday and even if I were I should be in no fit state to join the Revels. I was attacked in Switzerland with bilious fever, so sharply that my life was despaired of and I had a very narrow squeak for it. I was on my way to Italy, but the English physician ordered me at once back home and told me to sojourn at this place for a little while. He was right; the air is rapidly setting me up and I hope by the beginning of next month to be in harness again". 8vo. Approx 7 x 4.5 inches. Mounting traces to verso, else fine. Edmund Yates was a successful 19th century dramatist and a close friend of Charles Dickens. He was also the author of several novels, including Running the Gauntlet and The Black Sheep. D.R. Raw was secretary to the Maybury Club, a society for actors, authors, writers and dramatists.